Velvet Paw Creations: "Yellow Daisies in Her Hair" Zentangle Card + Smudgy Antics Blog Change! 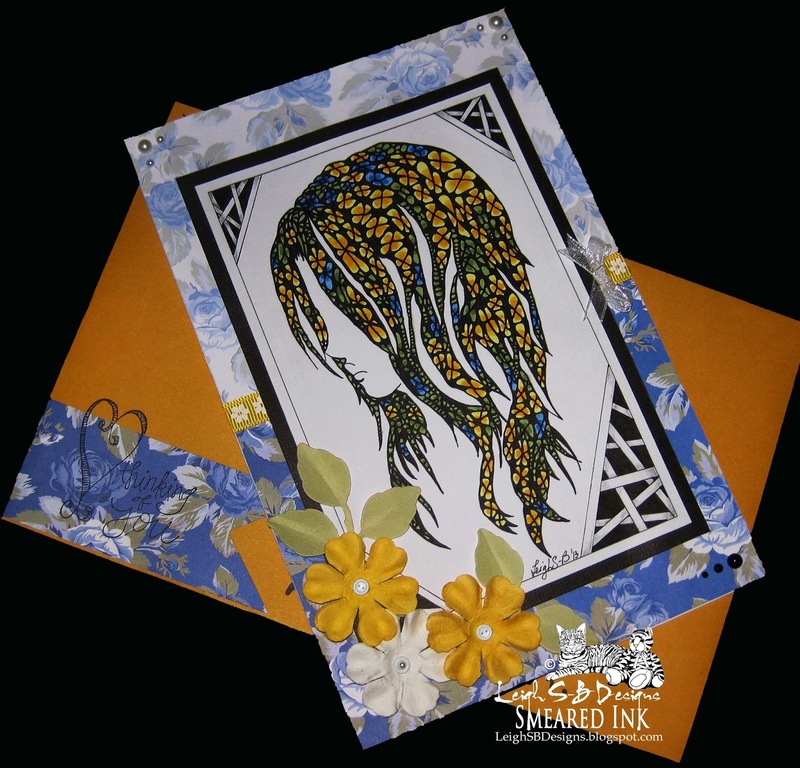 "Yellow Daisies in Her Hair" Zentangle Card + Smudgy Antics Blog Change! It's week 2 already of our new "Anything Goes" challenge over at Smudgy Antics! First some news on a change that will take place once this challenge ends! The Anything Goes challenge will be the last one on the Smudgy Antics blog. Once it ends and the winner announced on Dec 1 the blog will be discontinued and all future Smudgy Antics Challenges will move over to the Smeared and Smudged Forum in order to keep all our awesome challenges available in one spot. The Smudgy Antics Challenges will become "Anything Goes" all the time and can be found in "The Challenger" group on the forum and we will continue to offer a prize from the Smeared Ink shop! 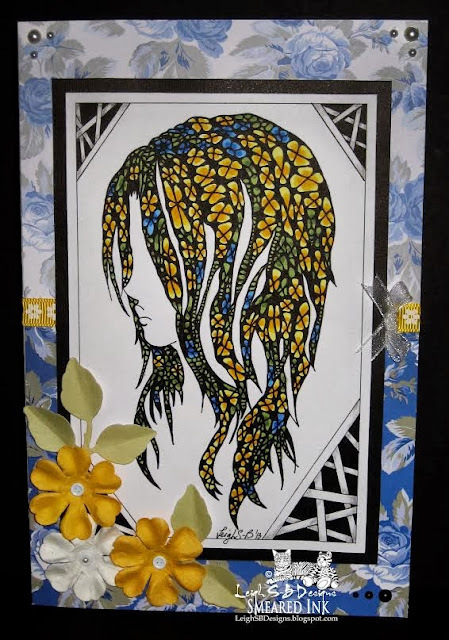 April this year I shared a Zentangle card called "The Girl with Daisies in her Hair" and now I'm back to share another card I made taking my Zentangle version of Smeared Ink's Girl 3 image from the Hidden set further. Zentangles don't just have to be black and white with some pencil shading, they can be colourful too! See my original post for all the deets on the black and white version. I decorated the girl's hair with my 'daisies' variation of the Nzeppel Zentangle then added the Hollibaugh Zentangle in all 4 corners. I used Copics to colour the image in yellows, blues and greens. I used my Perfect Layers tool #1 and #2 to trim leaving a 1/8" border of white cardstock then adhered the panel to black cardstock with Scotch Quick Dry Adhesive and cut the black mat leaving a 3/16" border. I made a folding card from white cardstock and adhered two pieces of decorative paper to it with a strip of yellow daisy ribbon covering the seam. I then embellished the card with white and black self-adhesive pearls, paper flowers with white button brads in the centers and Spellbinders die cut leaves. I also decorated the inside, but that's a secret for now teehee, and made a matching envelope with a stamped message (Studio G) in jet black Archival Ink. Stunning card you made! =) Great coloring!